Riding to and from the 2010 Hamm Diesel Motorcycle Rally. 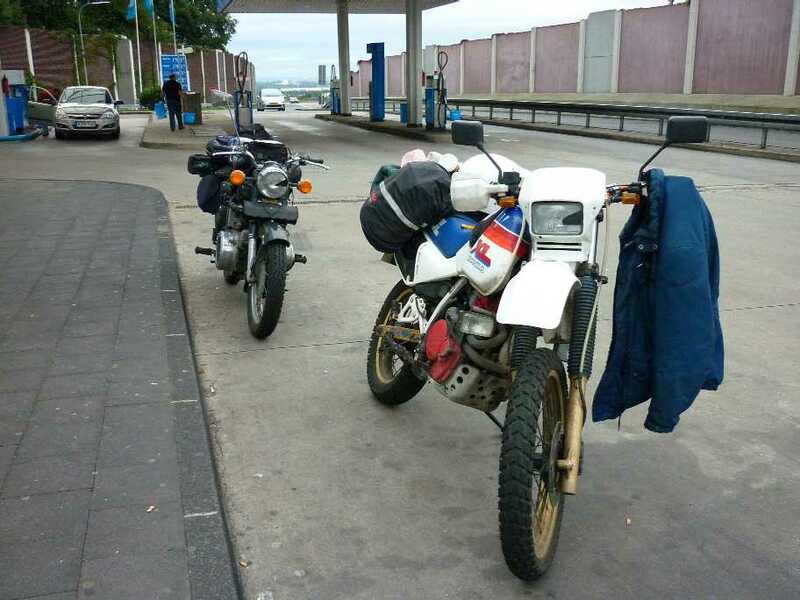 This was our ninth year of riding out to the Diesel Motorcycle Rally in Hamm and I can honestly say that in all that time we’ve had it pretty easy. Sure, there have been punctures, hold ups and wrong turns through the years but in all that time we’ve never had to deal with anything too troublesome. 2010 was different. We set off from the North Sussex area at 7.30am in order to reach Newhaven by 8.15. The boat times have been getting steadily later and later each year which slowly eats into our riding time once we hit France. We’ve tried riding other routes to the North but they always entail a two hour ride to Dover followed by immediate death duels with thundering juggernaut trucks on the main arterial into France. Much better to have a 45 minute hop to the coast, a 3.5 hour crossing followed by a quiet start on the D1, a road equivalent to one of our minor C roads. On this occasion we left home in the drizzly, misty rain and arrived at the port pretty dry. We were both wearing our breathable motorcycle jackets along with pull on waterproof leggings. Not Ideal I know but all we had to hand. Whilst waiting in line the rain became heavier and we ended up getting pretty soaked as the columns of cars slowly edged forward towards the customs posts. When we did eventually get onto the boat we were much wetter than we should have been. After negotiating the ramps we followed the directions of a beckoning crew member and aligned our motorcycles between the cross-cut holes in the deck. I found it pretty easy to get my Diesel Enfield onto the centre stand despite the floor of the boat being slippery metal. It’s a heavy beast but thankfully the highpoint I have to roll it over isn’t that high. Jeff, on the other hand, has problems with the XL600LM. The Honda comes with a fold out handle to help (which is more than some bikes have) but it still has to be hauled up pretty high and it’s not easy when it’s loaded up like it was. Unlike some, we think it’s never a good ideal to take the easy route and strap the bikes down on the side-stand either. All that low engine vibration from the boats engines coming up through the bike, well, you can just imagine it not being too good on the welds can’t you? The crossing was pretty uneventful. The slow rolling of the boat, the lukewarm, rather watery breakfasts and the usual multitude of sleepy, bored and blank faces is always the same, year in, year out. I buried my head in a autobiographical paperback I’d brought along and was immediately transported into the violent world of the Blackpool Nightclub Doorman whilst Jeff looked on and said out loud that he’d brought something to read. Just under four hours later we looked out to see the ferry moving into a rain soaked Dieppe. The rain had been constant but relatively light during the crossing but as we neared our birth a brief downpour resembling ‘stair-rods’ rattled away on the windows and decking alike. 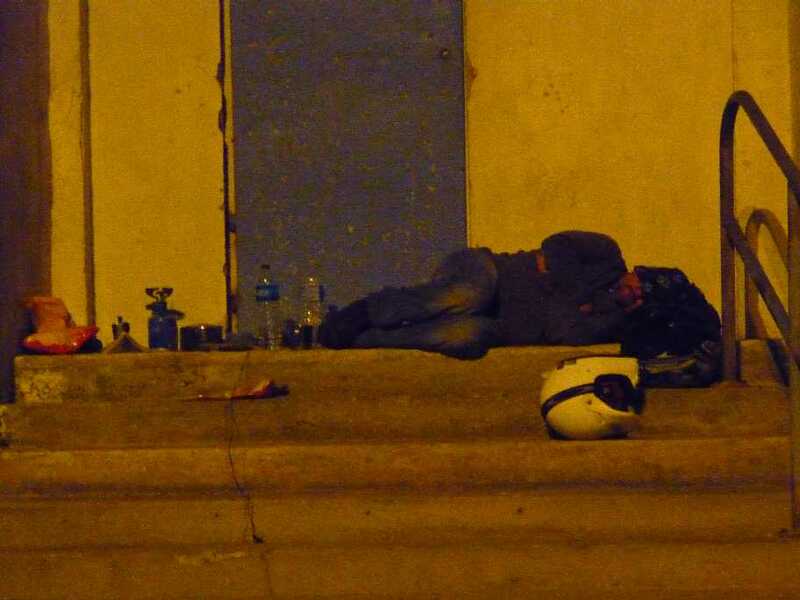 Welcome to France. After getting the call to return to out vehicles we followed the rest of the herd and slowly made our way back down the perilously steep staircase and into the cavernous and booming bowls of the boat. The air was filled with the sound of echoing shouts, roaring engines, and metal on metal crashes as the crew released the straps holding the bikes down and threw them aside. Kicking the anti-roll, rubber blocks away from our wheels they motioned for us to mount up and then retreated away to wave the first of the giant trucks out. It’s normally a blessed relief to escape from a ferry after being ‘imprisoned’ for what seemed like a lifetime but on this occasion I wasn’t so sure. The rain had let up a bit but it still looked pretty grim out there. Never mind, we were out! With our lungs rapidly filling with fresh air all of a sudden, the bad weather didn’t seem to matter quite so much. We both negotiated the diagonally stripped ramp with some caution, our rubber not at all liking the fact that the grip was virtually non-existent. After a quick flash of the passports to a female standing before the gates, we were off and out through the exit. Gunning the engines we climbed up the short road cut into the Alabaster cliffs and made our way out to the roundabout at the top of the hill before turning right down into Dieppe. The rain was light but there was plenty of spray about which never helps. At the next roundabout we peeled off onto the D1 and began our penetration of Europe in earnest. It was nice not having to deal with articulated lorry’s from the off but we had to keep the speed down a bit from normal because of the conditions. It’s not unknown for me to experience some dodgy speed wobbles on the fully loaded Enfield and I didn’t want to take any chances right at the start of our trip. The D1 is a nice quiet road but it’s sometimes littered with farm debris. As we pushed on, mile after mile, the rain fall became more constant and I could feel it slowly seeping into jacket at most points along the front and around the neck. I’d coated it with waterproofing agent and it didn’t seem to do much good. The waterproof trousers had been pulled up above my waste and were proving better. But it wasn’t enough. The water was now rolling down my jacket sleeves and into my gauntlet gloves. I lifted my left hand from the grip and squeezed. What seemed like a river of water cascaded out and was broken up in the swirling wind. Great. Riding through rain on a bike is like being in a wind-tunnel and we had a good few hours of it to look forward to yet. There was nothing to do but wipe my visor with the back of my glove and twist the throttle open as much as I dared. Up ahead the general perspective was broken only by my brother on his XL. He was wearing a white motocross style helmet and goggles which he fully admitted was not the best garb to be attired in for this kind of run. The rain was stinging his face as it hit through the gap between and he had a constant problem with his lenses misting up. Hanging back to avoid his spray had its own hazards. As we started to ply the busier N roads cars would cut in-between us showing little respect for a pair of riders tethered by nothing other than desire and determination. With the constant rush of air in the helmet, the ‘swishing’ sound of vehicles hurtling over wet tarmac and grimy, lopsided Citroen’s constantly threatening to end our existence, we ploughed on into a bleak looking France. The long, straight roads across this large country make for excellent riding. They cross the rolling plains, undulate up and down and are generally kept in good repair. Frequent throttling down is required as you pass through quiet farming communities populated solely by old women and youths on scooters. In bad weather even these people seem to disappear and you are left to ponder how anything ever gets done at all thereabouts. We pushed on through Neufchatel-en-Bray, Aumale and Amiens before the last leg of the day took us to Peronne. In the old days we’d push on to Mon’s and camp at the city centre municipal site but what we the ferry times changing we’ve been plumbing for Peronne of late. Again, there is the municipal site at one end of town but just lately we’ve been staying at the privately run concern situated on the canal. We rolled up at reception with the rain still sheeting down. The site was still quite full, especially with camper vans and people were running here and there in an effort to escape the weather. We dismounted and, like drowned rats, squelched our way into the office to book in. The young guy at the desk was smiling at our appearance and I couldn’t blame him – we were drenched. With water pouring from every possible fold we proceeded to slowly extract our wallets and passports before paying up for a nights camping - deux tent, deux Moto, deux personnel, s’il vous plait. The water had somehow found its way into the sealed bag containing Jeff’s papers and he was not a happy bunny. We then enquired as to whether the site had a dryer. It did. Oh bliss! We quickly purchased four tokens for this unsuspecting machine and retired back outside to the motorcycles. Dead ahead of us was the block containing the facilities and we decided, almost telepathically, that we were going to camp very close to them. Possibly even in them, such was our situation. After we’d ridden the short distance over to them I immediately began to have my reservations. Directly opposite the facilities was a volleyball court. But nobody was going to be playing anytime soon in this weather and Jeff gunned his engine and rode straight across it into the far corner which had cover from the trees and started unpacking his gear. I too then rode into the corner but due to having slightly less cover decided to erect the tent under the porch of the facilities. 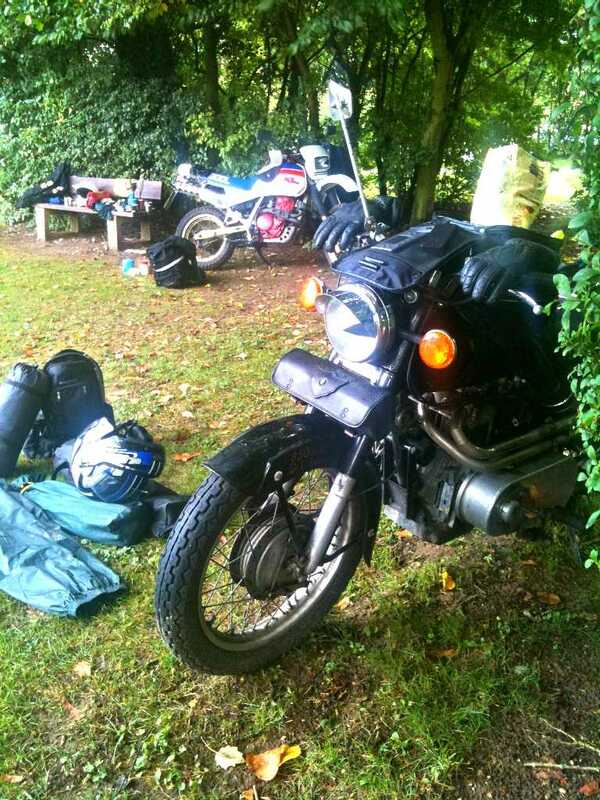 Once the tents were up we checked the contents of our panniers. Not having proper luggage I’d made sure everything was stuffed into bin liners. Good job too. Although it wasn’t quite winter, the constant wind and wet had taken its toll on me. I was feeling cold to the core and thought I was on the verge of coming down with something. We lost no time in moving into the block and getting the wet clothes off our backs. The first token went into the dryer along with jackets, trousers and Jeff’s boots. We fired the rather industrial looking machine and, along with a loud rumbling sound, the lights above us dimmed alarmingly. 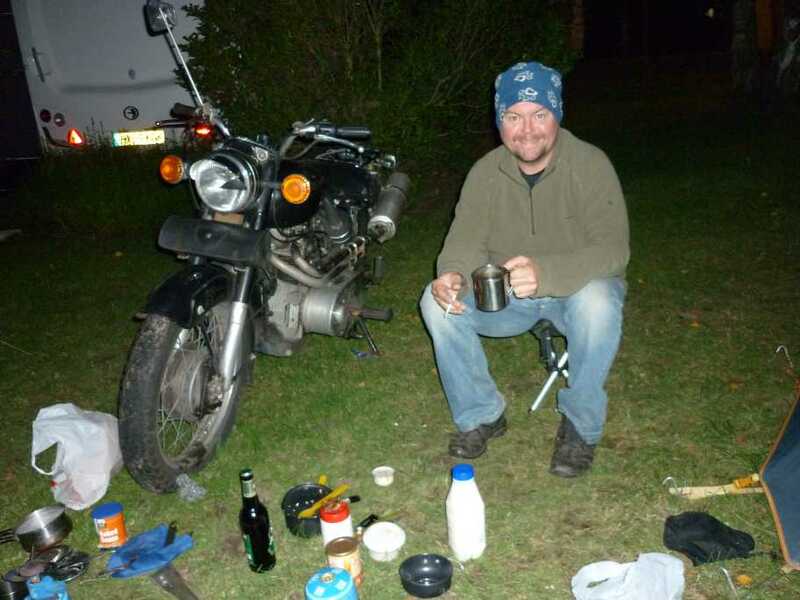 Then we broke the cooking stuff out and whilst other bemused campers came in to do their washing up at the lines of sinks, we brewed up tea, coffee and eventually our food. 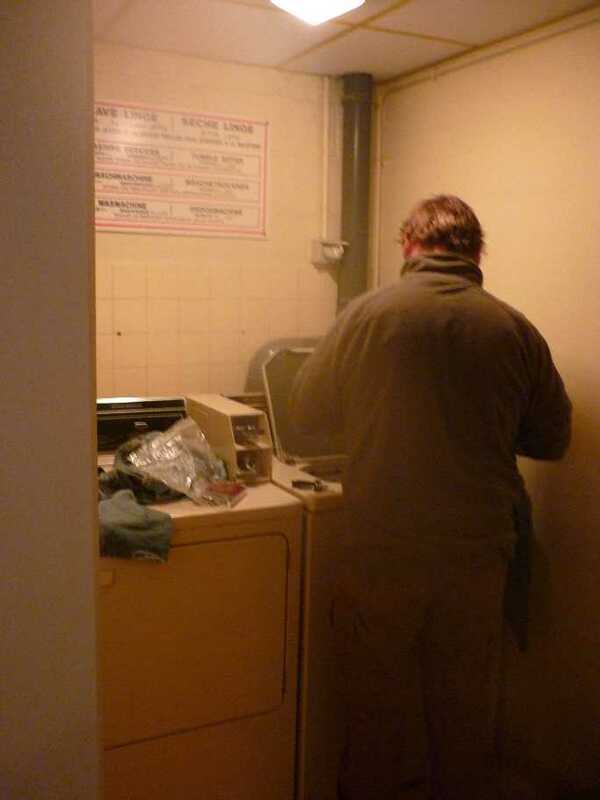 Jeff prepares another batch of wet clothes for the dryer. The cycle on the dryer was 45 minutes and it eventually spewed out only half dry items. Jeff’s boots had had the soles partially torn from them but apart from that there was no other damage. In went the other stuff for another two cycles until everything was finally made warm and dry. Then we packed up the stuff and retired back to the tents through the now light rain. We’d been under canvas for a short while before the heavens again opened. Thankfully the Coleman tents we were using were more than capable of keeping out the rain and we soon fell asleep to the pitter patter of the water hitting the outside of our temporary homes. Packing away the gear Thursday morning. Thursday morning was damp from the night before but thankfully it wasn’t raining. We simultaneously packed down and cooked up and, after a couple of pictures, made it away just after 10am. There is a fuel station at the entrance to the site and so we decided to top up before the off. Still showing signs of fatigue, Jeff pulled out on the wrong side of the road and I blindly followed before we realised our error. Luckily there was no traffic and we swung straight onto the garage forecourt and began to fill up. Seconds later the door to the cashier’s office burst open and a guy came flying out waving his arms. Another guy, busy filling his car, repeated my words and the attendant who, milliseconds before, was wide eyed and agitated, quickly calmed down and began to scrutinise my motorcycle. When I paid my bill I left him a card showing the web site details. We pulled away and tracked the short distance back to the N29 before continuing on our way to St Quentin. After a short distance we hit what was to become the first of many diversions. It took us off into the countryside before eventually looping round back to the main drag. As we neared St Quentin I took over point as Jeff couldn’t recall the exact route. I’d ridden out alone in 2009 whilst he and his partner Shelley had gone a different route in their van. We just came up against so many of these it was maddening. After successfully getting us around that town and up to the Riqueval turnoff, we headed on up that road but soon found ourselves up against another diversion or “Route Barree” sign. Just beyond the dreaded road sign we saw the accompanying and extensive road works. This route appears nothing more than a small cut through but it goes straight as a dye to Bavay and Mons and was used by a lot of heavy traffic. As a consequence I suspect that the road surface was probably worn out and busy getting patched up. There was nothing for it but to again follow the signs. As before, they took us around the houses before finally getting us back on track. But then again, as we neared Bavay, yet more diversions were in place! We pulled over to the right of a roundabout and noted that even most of the car drivers thereabouts didn’t know where to go. Eventually we chose correctly and found ourselves closing in on the motorway section that leads towards Mons and directly onto the main route to Charleroi, Liege and Aakhen etc. We’d negotiated all those diversions and could now get on with the business of knocking out the miles all the way to Germany. Or so we thought. Up ahead the signs for our turnoff loomed large. I even saw Jeff start to bank off to the right in readiness to roll down the slip road but disaster! 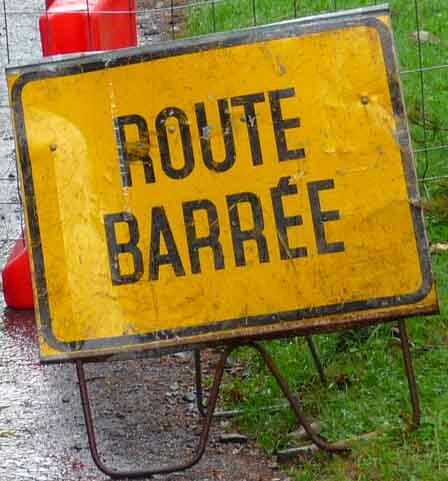 ‘ROUTE BARREE’. I looked to my right and down onto the road we wanted to take and saw a huge road gang with their machines completely covering that section. 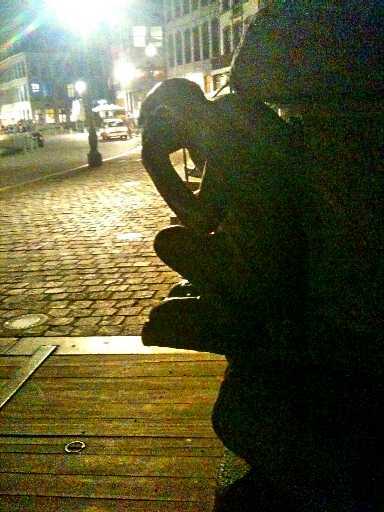 Jeff took a hand from his bars and gestured violently in frustration, his bike wobbling as he did so. It straightened up immediately he refocused on the road ahead and the Honda continued on down the overpass with me behind. This was getting to be a bloody pain in the arse! Almost immediately we came upon the familiar diversion signs and like lambs to the slaughter followed them. In what seemed like seconds we found ourselves on the motorway heading for Lillle. At this point I must confess that city geography wasn’t my strong point and I didn’t know where the F**k Lille was. All I knew was that I didn’t remember ever having gone through it before. We rode on fully expecting to see another diversion sign any minute but mile after mile, exit after exit, there was nothing! Finally Jeff signaled to pull over and we throttled down and came to rest in one of the many parking lay bys. It didn’t take us long to figure out that this diversion was purely for the trucks and there was gonna be no more diversion directions until the Tournai junction, just before Lille. We were f**ked! As we were most of the way there now we settled down to the realisation that we might as well follow the route through. It was frustrating and, after a day like yesterday, another disappointment. But what could we do? We stretched our legs, took a piss in the bushes and mounted back up fully in the knowledge that we had just added a further three hours to our journey. We were turning the air blue cursing the highway authorities and it’s a good job there were none of them about to hurl abuse at. Hunched over the tanks and probably with frustrated truckers for company, we barrelled on and turned onto the A8 for Brussels. When we eventually reached there we dropped down towards the Charleroi junction and eventually found ourselves a mere 26 kilometres from Mons. If our bikes could have been powered by expletives I’m sure we would have set some kind of speed record at this point. Sadly they weren’t and we had to face up to a further six hours riding after already having been in the saddle for just over four. Well, at least it wasn’t raining. The rest of the trip that day was pretty uneventful. We made an effort to have more rest stops mainly because we felt needed it. 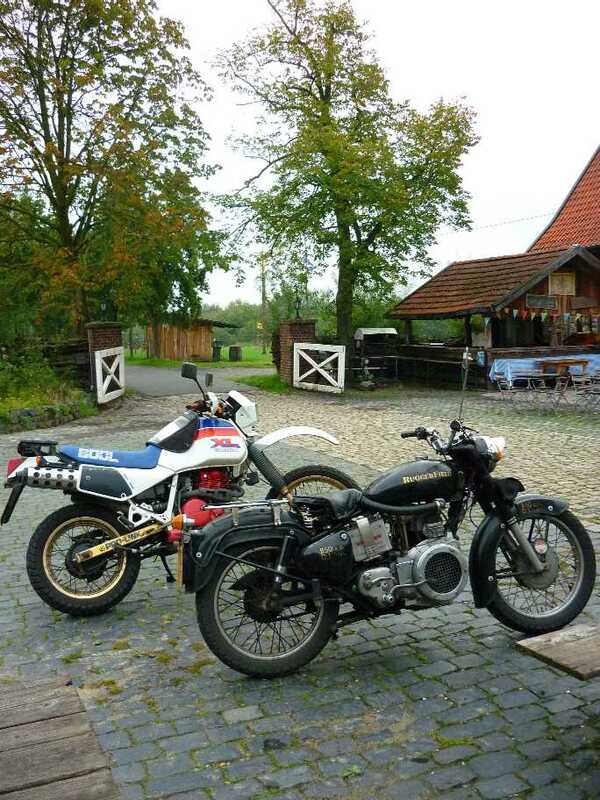 The bikes were running very well and the fuel consumption was excellent. It almost goes with saying that the Ruggerfield’s diesel engine was consuming very little and was doing about 120 miles to the gallon. And the XL600 was doing better than it ever had after I’d reduced the size of the rear sprocket by two teeth. Before the modification it was revving too high, like it was still geared for off road work. Now it was much better. It helped, of course, that we were cruising at a steady 60MPH, a speed which is ideal for the diesel 850. After we’d negotiated some minor rush hour congestion on the Wuppertal road north of Koln, the last of the light started to fade away as we neared the Hagen section. When will they finish the work on this road I ask myself? It’s been going on for the nine years that I’ve been traversing it! Finally, we jumped onto the A2 to Hamm and found even more road-works. Junction 17 seemed to be missing altogether and with a mist in the air, darkness upon us, the road lanes compressed and oncoming traffic blinding us with their headlights, I was lucky to spot junction 18, the Hamm turn off. I swung the bike to the right and looped down and around to the illuminated intersection below and came to a stop at a red light. Traffic was noticeably lighter here and as Jeff pulled up on my right I looked over and could clearly see the relief on his face, even through those wet goggles. I’m sure he could see it on my face too. 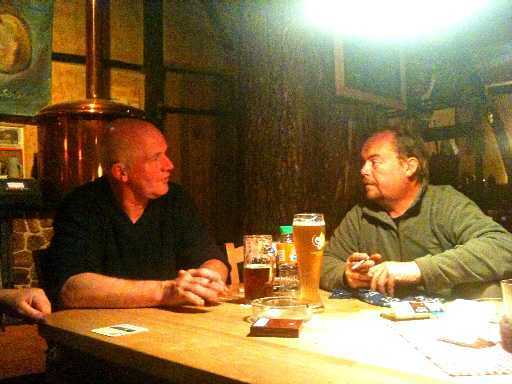 It was great to get off the busy Autobahn and get to a point of local familiarity. When the lights changed to green we switched to autopilot and did the last few miles through the village of hamm and then the countryside to Brauhof Wilshaus where we rode straight into the courtyard and parked up. 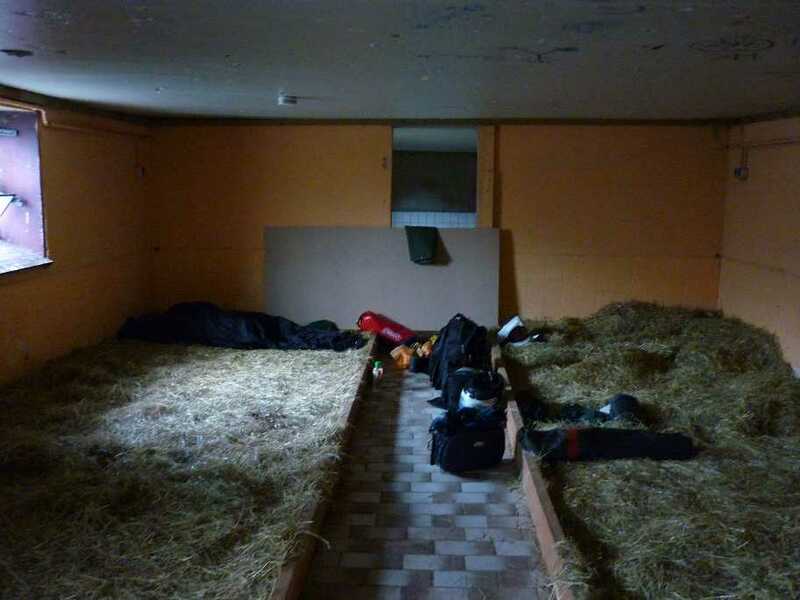 We weren’t going to put the tents up in the dark, wet field and decided instead to crash out in the barn. Rally organiser Rafael and some other early arrivals piled out of the bar to greet us and it was a welcome appreciated more than usual, I can say. It had been a trying two days compared to what we normally endure and it was time for a beer. Finally, it was good to sit down in the warm bar at Willy's place. And get a free, first beer! The barn where we crashed Thursday night. I think Jeff is still asleep on the left there when I shot this. 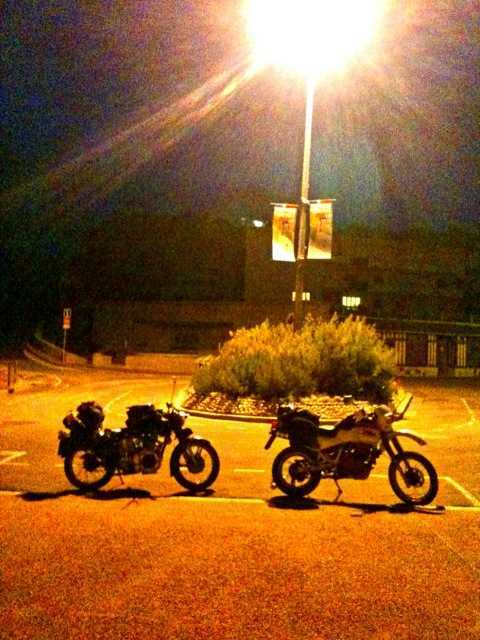 The bikes as we left them that Thursday night. Checkout the weekend Rally report here. The ride home was far less stressful and we started out in no hurry at all leaving Sunday lunchtime. As we left Hamm we did get some misty rain coming in but it never really got to the point where it was troublesome. We hammered down the Hagen Autobahn and turned off for Liege without stopping nearly as much as we had before. Another service station. At another station an Italian had jumped onto my bike exclaiming "Mama mia!". I kid you not! 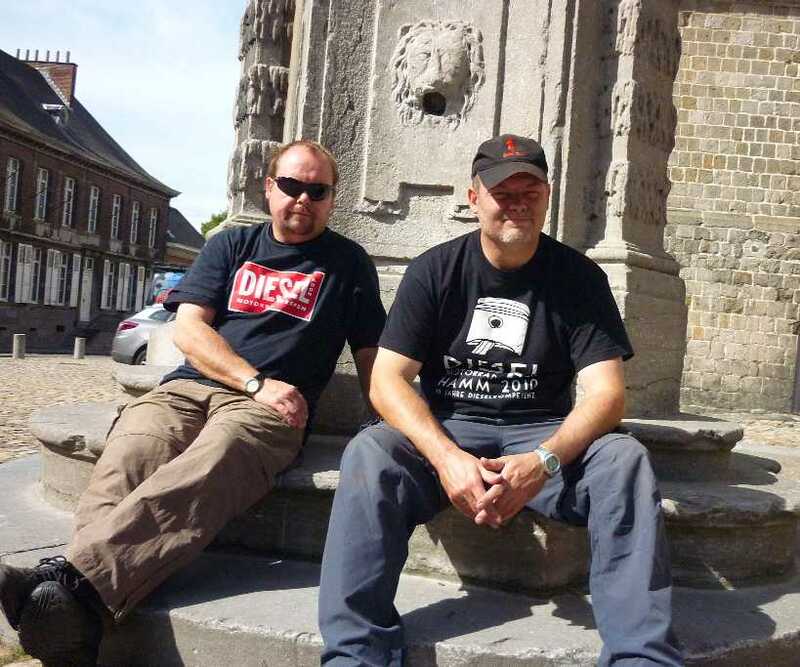 Jeff got an upset stomach after we stopped off for a coffee at a service station and we decided, by about 5.30 that day, to camp at Mons. It's handy when you know to find a campsite when you need one. This one is just off the Mons ring road. In the end we decided to rest up for all of Monday there and took in the town both at night and during the day. We took the time to follow the tourist trail around the back streets down to the station area and then walked back to the centre via the main shopping streets. 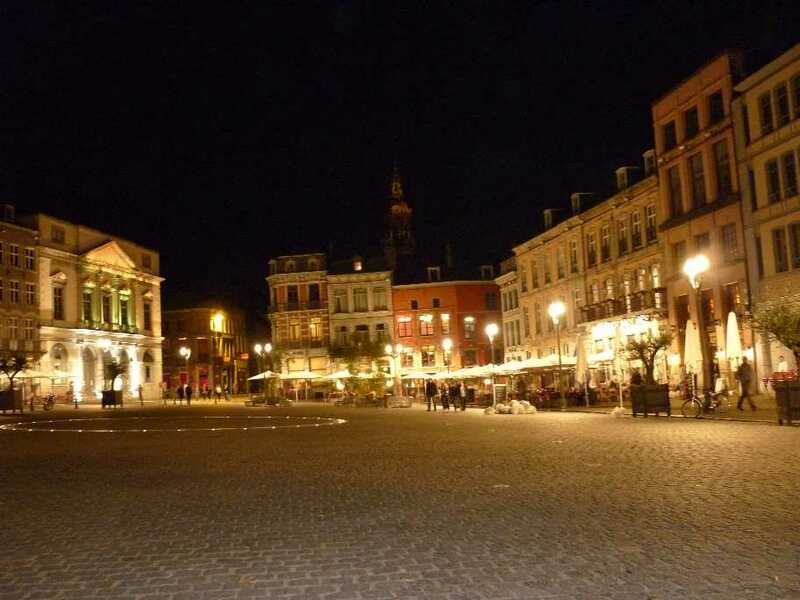 Mons by night is always a sight to behold. 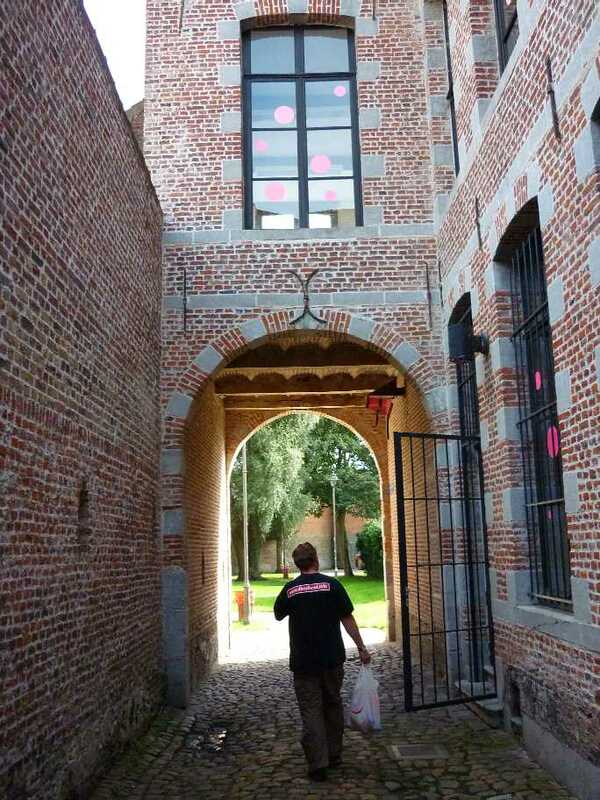 Nice to see familiar high-street names such as HMV, M&S ect..Sitting in the cobble stoned centre of Mons we ate at McDonalds and visited the tourist centre amongst other places. And it was good to cut off into some open doorways and re-discover hidden courtyards and gardens we'd last seen a few years before. One of the many pleasure's hidden away behind official town buildings. 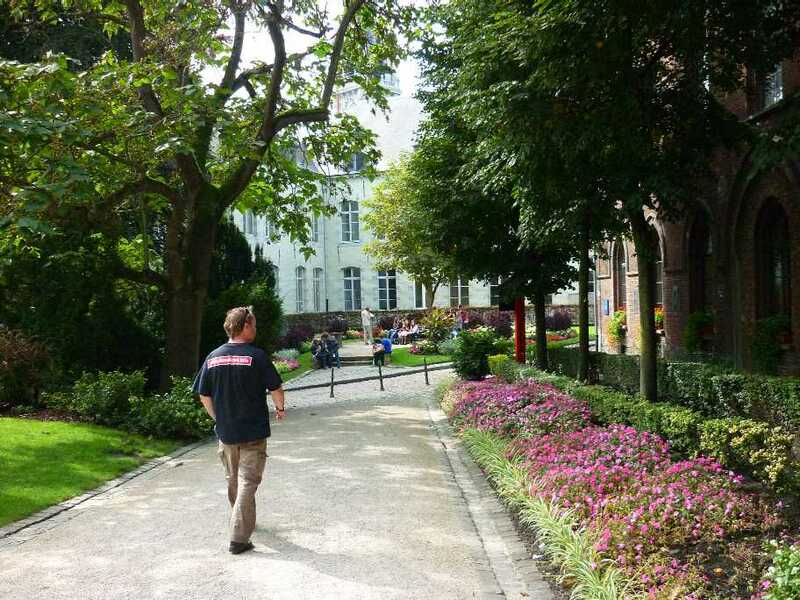 We weren't shy when it came to exploring Mons. Being a university town the place was swarming with students. Earlier, as we'd begun our walk around the outskirts we'd passed several groups of youths obviously smoking dope. Now there's a fine thing....! Resting up by a church during our walk about the town on Monday. Good to see our old friend the Lucky Monkey of Mons again. 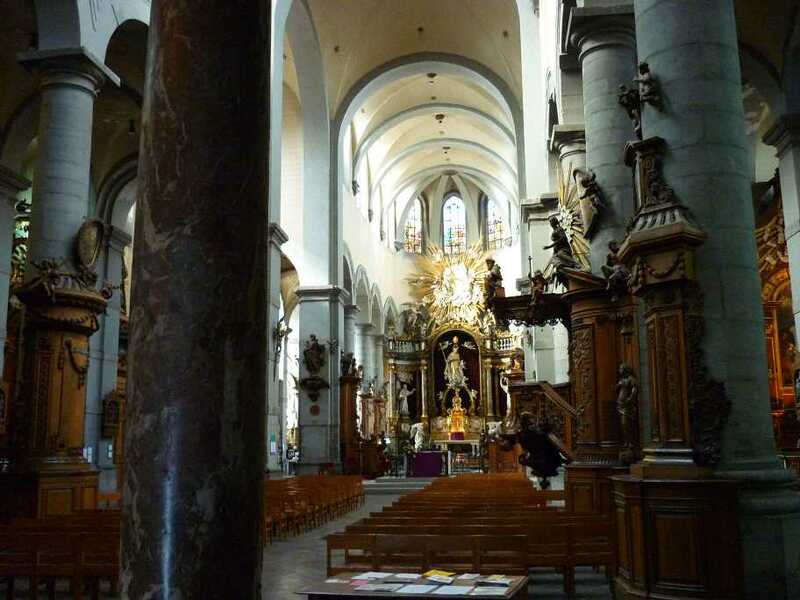 We looked into several churches in town. All were pretty spectacular. 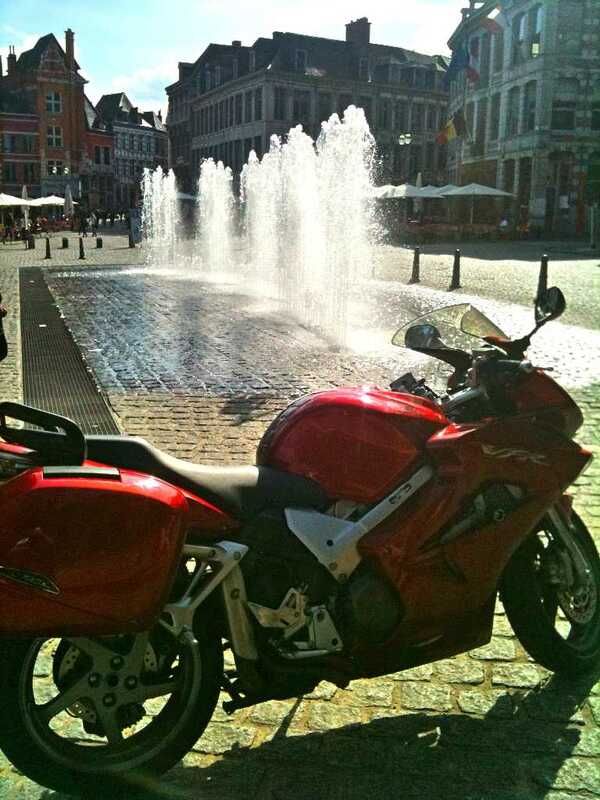 A Honda parked up by the Computer controlled fountain in the centre of Mons. It turned out many of the lesser shops were actually closed Monday so when we decided to purchase some gifts for the ladies in our lives we found that we had to rush into town Tuesday morning before we made our gettaway. We were actually scheduled to come home on the Wednesday boat but had decided to make a dash for the Tuesday one instead. The problem was that we misjudged the distance and didn't quite make it in time. To avoid the diversions we'd encountered on the way out we took a different route which included Cambrai, Arras, Abbeville and Le Treport. Somewhere on the road between Mons and the coast. We only encountered one of the dreaded Route Barree signs, this on the outskirts of a small village we headed through. Jeff totally ignored it and gunned his Honda straight down the high street with me in hot pursuit. It turns out that a small Fair or Circus was just packing or setting up and drive right by without any hassle. If I'd had seen any clowns they'd have got a withering look from me I can tell you. I'd had enough of barred routes! Somewhere else, I can't remember where, I hit a prolonged patch of bad road and developed a speed wobble which seemed to go on forever. The road surface had been broken up ready for work but that hadn't started yet. How considerate! Our second stop for food. Got some interest in the bikes here as usual and handed out a card with web site details. When we did finally reach the terminal in Dieppe we were just too late for the 5pm ferry. The cars were queuing but the customs officials were not in their boxes! Blast! We went for a ride in search of food and ended up at a Le Mutant store. I went in first whilst Jeff stood by the bikes but it turned out to be more of a bulk purchase kind'a shop. After I'd figured this out and broken open a few packs to buy single items I paid up and walked out only to see that they were now closing. Jeff ripped into me for taking so long and a brief but loud argument ensued much to the bemusement of the shoppers thereabouts! The bikes parked up opposite a Memorial for Canadian Troops. We had hours to kill. 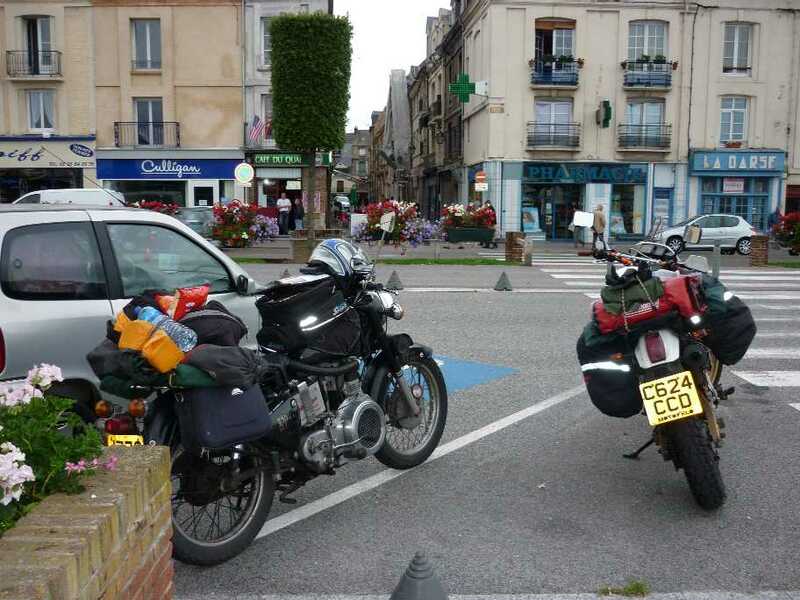 When we'd calmed down a bit we went in search of another store and after getting yet more grub we rode to a small seaside village just up from Dieppe. Here we ate and drank tea and coffee until the sun went down. We had hours to kill before the next boat which, annoyingly, was at 5am. 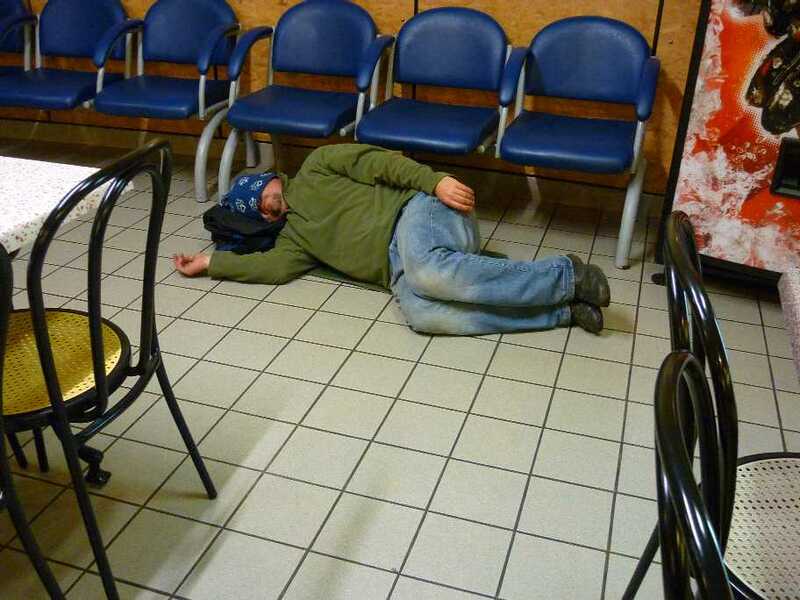 Getting some shut-eye whilst waiting for the clock to tick down. Luckily it was quite warm that night. At gone midnight we packed up our stuff and headed back to the terminal where we were allowed to crash out by the cafe. It was closed at that time of night but we had more than enough food and drink to keep us happy. Getting more sleep - this time at the ferry terminal. Eventually we roused ourselves and got inline at 4am only for there to be delays. luckily, the misty rain that had started to come in as we'd reached the terminal at midnight decided to let up and we didn't get too wet. Eventually, after all the trucks and cars had gone first, we, along with a Harley rider and his girlfriend were allowed to board. After reaching our seats we got some sleep before tucking into a breakfast. By then we were almost back to England and it wasn't long before, bleary eyed, we trudged down to the lower decks and mounted up onto the bikes. It was a nice morning in Newhaven and we got through Custom's without any trouble. After a 40 minute ride we were home and unpacking. One of the more memorable rides to Hamm I'd say. And not all for the right reasons but hey, you gotta take the rough with the smooth right? As always we had a great time in Hamm and I'd urge anyone who's thinking of making the trip one year to do so. The hospitality is excellent. PS: Lessons learned from this ride? Plan an alternate route, just in case of trouble and wear some one piece waterproof gear. Oh, and get to the ferry port with time to spare.